Another very hot day predicted. At 10am the beaches were already filling-up If the chap in the legendary pink suit stands by Margate Clock Tower at approximately 1pm I will try and photograph him. I'll be interested in how busy the Dreamland site is today without any competition from the World Cup. 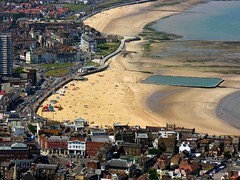 I have to admit though, that the council's recent efforts to make "Thanet Beautiful" really show up well from the air. If you look at the photographs in the library and compare last year with this year, I'm sure you will see the difference. Did everyone know that the time traveling Dr is in Thanet? He manages to take a picture of Margate sands at 10:00am and get it onto this site at 09:42am. I'm 99 (so I'm told) please can you take me back in time so that I will be 50? no perhaps not this is about the time I got divorced. O.K. 60? no this is the time I had to start pill popping. O.K. old enough to have all the knowledge I have today but young enough to enjoy it. Lets say 25? no this is the time I first found the ex playing around. Decision time.... 21 then I will know all the problems I have to come and I will be able to take evasive action. Yes!! please can you take me back? Perhaps Thanet Council are finely employing men to do the work they are paid for instead of employing men to stand chatting whilst propping up their working tools. Well done Thanet Council Employee's and employers for picking some of the correct workers.